Every year on a Saturday in March, at the crack of dawn, hundreds of people from all walks of life gather at the City Mall, Onikan, Lagos Island, for the Lagos leg of the annual Worldwide Endometrioisis March (EndoMarch) event aimed at breaking the silence around Endometriosis—a silent but growing health condition that predisposes women of reproductive age to ill health, infertility and severe periodic pains. The early morning five-kilometre walk traditionally terminates at the Muri Okunola Park, on Victoria Island. It is put together by the Endometriosis Support Group of Nigeria, ESGN, in collaboration with Diamond Woman (a female-friendly initiative of Diamond Bank Plc) to raise public awareness and keep women on the alert about endometriosis. Endometriosis affects an estimated 170 million women worldwide and occurs when tissue similar to the lining of the womb is found elsewhere—most commonly on the ovaries, in the recto-vaginal septum, bladder and bowels. The tissue bleeds every month, and can cause severe and chronic pain and makes life generally painful and miserable for the affected woman. 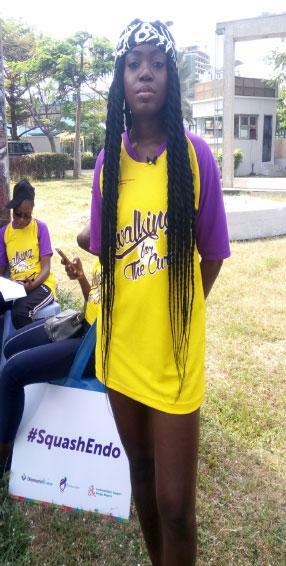 Among the long list of enthusiastic participants in the 2018 EndoMarch was popular Nigerian performing artiste, songstress, rapper and song writer, Saeon Moruda (Oluwaseun Omolara Oni). During the early morning event, Saeon who shot into limelight four years ago following her single titled, “Boogie Down” featuring Wizkid, opened up in a personal encounter about her battle with endometriosis. “I am a survivor of endometriosis and I am currently dealing with it,” she declared. Recounting her journey through the disorder, Saeon noted that although her experience was relatively short, it is unforgettable. She recalled how at a young age, she observed that she was having terrible abdominal cramps particularly during her menstrual period. “The cramps were unbearable. I could not keep down food whenever I was in my period. If I ate, I would throw up everything. If I drank even water, I vomited. It was always worst during my cycle. Saeon desperately turned to the internet for answers and tried to do some research. “That was probably the only thing that could have directed me. I kept doing countless scans from November 2016 and it was in June 2017 that the possibility that I might be having endometriosis emerged. The results showed I also had fibroids. Relief finally came for Saeon through surgery at the University College Hospital, UCH, Ibadan. She went through an intensive post operative process and has been on series of injections to suppress the pain. Saeon discovered that many people are diagnosed late because of lack of information and what she described as the ‘normalisation’ syndrome. Saeon hopes her story will increase awareness about endometriosis. In an admonition to women experiencing any form of pain during their periods, Saeon urged them to seek help instead of living with the pain. “As women, we go through enough pain so it is advisable to look out for it. If you have painful periods, it could be a pointer to endometriosis. If the pain is outside of your period it is equally a warning sign. “If you are in your reproductive years, visit your gynaecologist, who would do checkups. It is easier to manage an abnormality if it is diagnosed early. There is no known cure for endometriosis but if detected early, it can be adequately managed. Endometriosis could run in families, and there are different stages of pain, Saeon noted. “However, in my own case it is not genetic because my mother doses not have it. It is not at all easy to be having your periods and be rolling all over the floor or throwing up all the time. The more care you have the better for you. The bottom line is to try and be supportive to someone that has endometriosis. Do what you can. “If you know of anybody with such pains, advise them to see a gynaecologist. All women should get a scan at least once every two or three months in order to be certain what is going on with their reproductive organs. “Until I joined Diamond Bank I did not know about endometriosis,” Head of Corporate Communications, Diamond Bank (Diamond Woman), Chioma Afe, remarked. Chioma, who described endometriosis as a “big deal” for many women, explained that Diamond Bank and Diamond Woman specifically focus on women and have supported the ESGN over the past five years. “We are very passionate about women issues that include health and reproductive health issues and we have been working with Dr Ajayi and his ESGN team to generate awareness. We participate in the EndoMarch every year, and try to create awareness internally in our organisation because we have a huge clientele of women and a huge percentage of our staff is women. She said Diamond Bank was exploring support for the Association of Fertility Research and Health, AFRH, towards training more medical doctors so there would be more practitioners and more people that would understand the issue. The post Endometriosis: Do what you can to give your life peace — Saeon Morunda appeared first on Vanguard News.